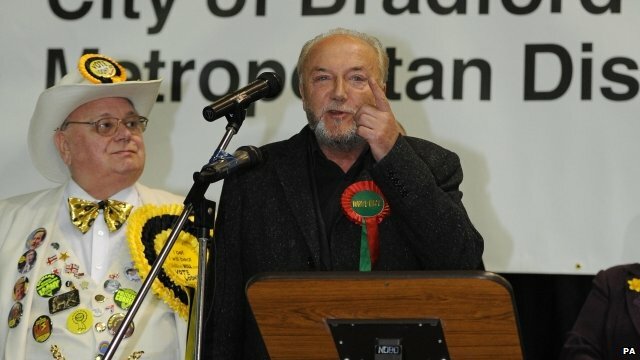 A shock result in Bradford West last night has returned the Scottish communist Islamist, George Galloway, to parliament. This is usually a safe Labour seat thanks to the extremely high immigrant population but Galloway has managed to take it from them for the Respect party with a campaign specifically targeted at the muslim vote. A letter he had distributed to the mosques in Bradford could easily be an application to be declared a good muslim rather than a begging letter for votes. The Respect rosette's are even a declaration of their Islamist credentials. But this is how democracy works of course - the people of Bradford have decided that they want a Scottish communist who laments the loss of the Soviet Union, supports repressive regimes guilty of human rights abuses, doesn't even live in Bradford and who is quite happy to stand in any constituency anywhere in the country to get into power. George Galloway has surely got to be the first communist Islamic fundamentalist to enter parliament and his election last night is a truly worrying development. Every party except UKIP and Respect lost vote share in the election. Respect got a massive 52.83% increase over the last election in Bradford West, UKIP a more modest 1.31%. But when you consider that Labour and the Tories both lost over 20% of their vote and the Lib Dems over 7%, a 1.31% increase for UKIP is actually a pretty big vote of confidence.